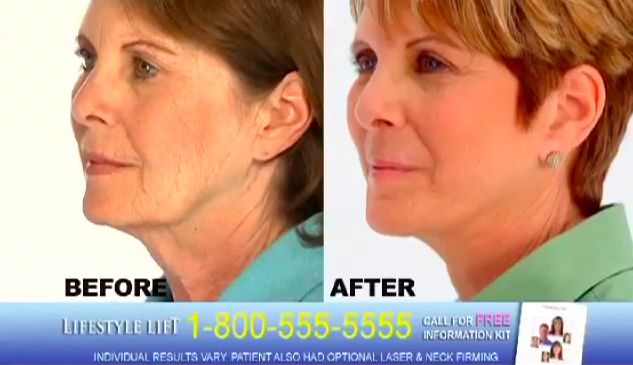 Here a Lifestyle Lift commercial claims to provide facelifts in just an hour. Cosmetic surgery chain Lifestyle Lift promises clients it can remove wrinkles, frown lines and sagging skin in just a matter of an hour. But if you were planning to stop by one of the company’s centers on Monday you were likely met with locked doors and few answers. Lifestyle Lift, often featured in informercial-like advertisements claiming to allow consumers to “look as young on the outside as you feel on the inside,” specializes in less-invasive facelift procedures that require only local anesthesia and short recovery periods. Lifestyle Lift came under scrutiny back in 2008, when it engaged in a he-said, she-said lawsuit battle with online review site RealSelf. The company sued RealSelf claiming trademark infringement after consumers posted negative reviews about their experience with the less-invasive facelift procedures. RealSelf subsequently countersued asserting the surgery center posted fake reviews to lure in more business. The back-and-forth led to an investigation by the New York Attorney General’s office. In 2009, then-attorney general Andrew Cuomo announced Lifestyle Lift would pay $300,000 and stop publishing fake reviews.